Dumping your garden waste in the countryside is fly tipping!! by Caroline Hall • April 9, 2019 • Comments Off on Dumping your garden waste in the countryside is fly tipping!! 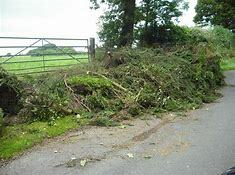 The parish council has become increasingly aware of residents dumping garden rubbish including grass clippings, leaves and branches along footpaths and right of ways within the parish. This tipping smoothers woodland plants, leads to increased nutrient levels where they aren’t wanted and encourages other forms of rubbish dumping. The disposal of garden rubbish in such a way is a form of fly tipping and will not be tolerated by the parish council or CWaC. If residents require additional garden waste disposal, on top of the bi-weekly green bin collection, another green bin can be purchased from CWaC for an annual fee of £40. Please call 0300 123 7026 to order an additional bin. ← The annual parish assembly for Little Budworth Parish Council will be held on Thursday 25th April at 7.30pm in the village hall.